Ask someone how they invest, and you’ll probably get a pretty standard answer involving stocks, bonds and maybe some real estate or cash. But rarely will people mention something that is even more important: their investments in human capital. They don’t talk about it because human capital investments can look a lot like any other expenses. I’ve thought about this for years, ever since I attended the Financial Planning Association’s annual conference in 2010. It’s one of the largest annual gatherings of its kind, and that year, Ian Bremmer, the president and founder of the Eurasia Group, a leading research and consulting firm on global political risk, offered one of the keynotes. It’s a funny question, because as my friend and colleague Tim Maurer says, “Personal finance is far more personal than it is finance.” So how Mr. Bremmer or anyone else invests doesn’t really matter to you personally. But financial planners can’t help themselves. We always ask this question. After a pause, he replied, “I just hired another Ph.D. at my business.” Now, this answer didn’t tell me how he invests his personal wealth or what assets he owns, but it did tell me something else even more important. Mr. Bremmer invests in human capital. What some might call an expense, he considers an investment. Consider the fact that he just as easily could have said, “I own a diversified portfolio of low-cost index funds.” But he didn’t. He was asked how he invests his money, and the answer he gave has stuck with me for years. Kyle Korver, a professional basketball player, made a similar choice in 2008. After Mr. Korver had some injuries, it looked like he was on the downhill side of his career. Then he started training at P3, the Peak Performance Project, in Santa Barbara, Calif., with Dr. Marcus Elliott. I have to imagine the training didn’t come cheap, either financially or in terms of time. But Mr. Korver was so committed to improving that he even moved his family there so he could stay close during the off-season. I think about this way of investing every time I work with a personal coach. Yes, there’s a financial cost. I’m betting a lot of people would define the cost of such a coach as an expense, and the Internal Revenue Service certainly sees it that way when it comes time to itemize tax deductions. But I see it as an investment in myself. Maybe for you it’s something simple like taking a class or two at the local college. Or maybe it’s more complicated, like moving to a new city to give your career a bump. In both instances, you can measure the results of these choices. A promotion at work or a new job would be a clear return on your investment. To be clear, there’s a big different between real, human capital investments and expenses masquerading as investments. Yes, watching some great documentaries may help you learn more about the world and thus count as an investment. Buying a bigger television to watch those documentaries doesn’t. It’s been more than five years since I heard Mr. Bremmer’s surprising answer. But it sticks with me to this day. He’s investing in human capital. I’m committed to making similar investments. So what kind of expenses can you turn into investments? 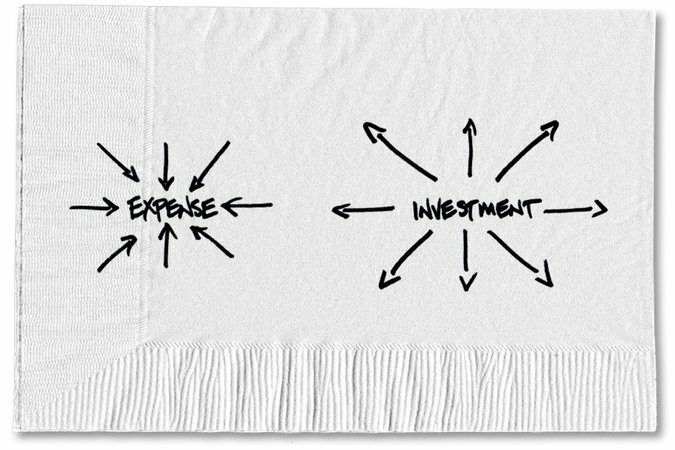 0 responses on "Featured Blog: When an Expense Becomes a Wise Investment Choice"